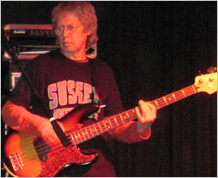 Joined by Christopher Harland playing Bass Guitar they initially performed as a duo until March 2004 when they were joined by Mike Townsend on drums. Their articulate and sensitive playing demonstrated influences from masters of the blues such as Robert Johnson, Freddie King, Buddy Guy and Eric Clapton. CHBB played an exciting mixture of original songs and cover versions of blues classics with the sound and musical style of the Chicago Electric Blues. During 2004-2007, the trio played over 100 live performances and produced two albums. 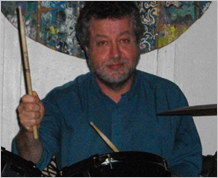 In June 2007, the band retired and Chris took his blues to Canberra in Australia. 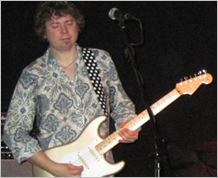 Mike Townsend is now playing Rock 'n' Roll and Christopher Harland is taking a rest from live performance. 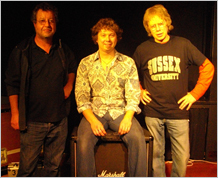 In October 2010, the UK band reunited for two live performances in Brighton, England. Playing to familiar faces from the old days and to a brand new crowd who were being introduced to the band for the first time, the 'old' CHBB wowwed all, playing as if they had never been apart. The spirit, passion, power and subtley were all still there for the two highly emotional and commanding reunion shows. Copyright © Chris Harland Blues Band 2005-2019. All Rights Reserved.